The family went to the President’s rally in Milwaukee yesterday. 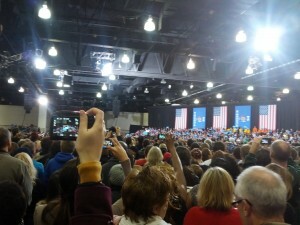 My daughter Erika who is ten and my eight year old son Alex were both excited to go and see our President talk. I think its important for children to be exposed to our political process. No matter who they eventually believe in or what party they eventually align themselves with, we want to make sure they understand that our unfettered right to vote is fundamental, and perhaps one of this country’s greatest ideologies. Well, we got to the frontier airlines convention center about 30 minutes before the doors opened and thought at first that we had done pretty well. 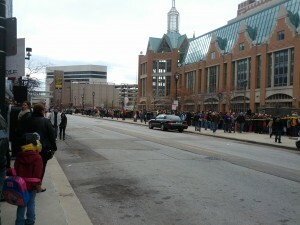 We could easily see the convention center, being just across the street from the doors. 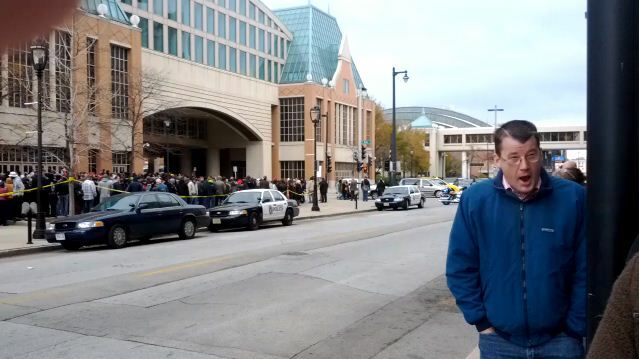 What we didn’t know was that our line went two blocks forward, turned right and went a block down the cross street, turned right again went a block, turned right a third time and returned to the convention center before turning left to cross the street to the line shown in the picture. Then it was three block long double backs before going around the corner to three more block long double backs before actually entering the convention center. Not only that, the line extended behind us for 2 more blocks of the same zig-zag! During the wait, we saw two Romney supporters with signs marching. One’s sign said “You should be in New Jersey helping Americans” (I couldn’t help but yell “He’s done more for ordinary Americans in the two days he was there than Romney ever will!”) and the other was a Romney/Ryan campaign poster. I pointed out to the kids just how impressive that fact was. “Why is that?” they asked, and I got the chance to explain that nobody was throwing sticks or rocks and most importantly, Government officials or even worse Religious officials weren’t removing them from the scene. Not only do we have a vibrant democracy, I told them, but we also have a tolerant democracy here in our great country; something we should never take for granted! Needless to say, it was a packed house when we finally got inside; it took us about an hour to get into the building after they started admitting people. When we got onto the floor, it was a mass bedlam! There were people holding up cameras and ipods waiting for the various speakers to talk. 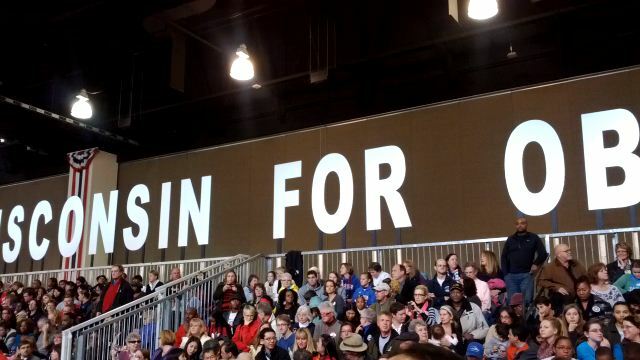 Chants of “Four more years!” sprang up often, and people waved blue “Forward!” signs from the stands. The kids had a great time cheering with the crowd and I couldn’t help but think to myself how nice this might have been if my parents had done this for me when I was their age. Needless to say, Katy Perry was a great hit with them, and I have to admit that even though I didn’t know most of her songs, she sounded pretty good to me too! All in all, a good time cheering on our favorite candidate for President. He is definitely well loved in Milwaukee!